I was going to go right to bed after my busy day, but I remembered that I wanted to blog every day so here I am, in bed, posting a half hour before the day is over. Tonight's post will be simple. 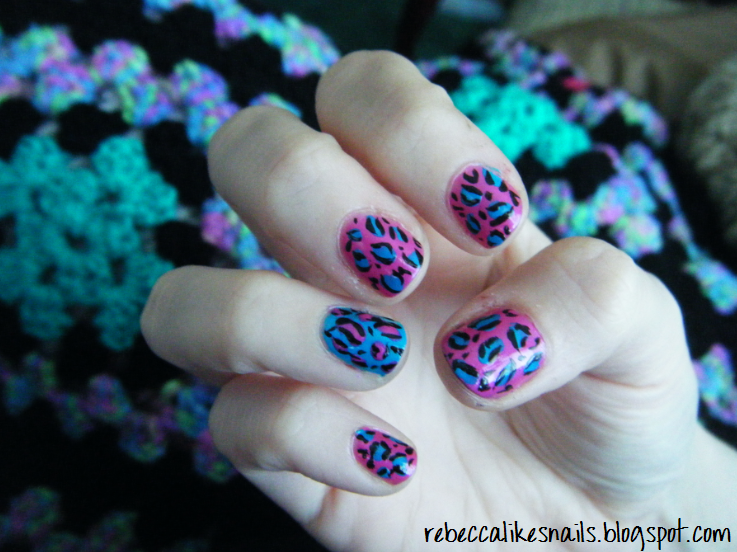 These are some of the first leopard print nails I ever did! I will have plenty more color combos for you in the coming days/weeks. Also seen in the background of this picture is the afghan I crocheted all by myself last year! I think the colors go well with this mani, haha. Oh also, tonight I started baking my first ever doll cake, you know, those ones where the dress is cake and you stick a Barbie in it. Tomorrow I'm decorating it. Wish me luck!